1 What is Kefir Milk ? 6 Where to Buy Kefir Milk Grains? What is Kefir Milk ? Milk kefir also known as keifer milk is a fermented milk drink that has a whitish, creamy, cottage cheese-like or cauliflower-like appearance which has the size of wheat kernels which is called the kefir milk grains. Milk kefir can be made from different mammalian sources like cow milk, goat milk, sheep milk, camel milk or even buffalo milk. Other sources include soy milk, coconut milk, almond milk. However, results may vary and nutrients are lesser as compared with the mammalian milk. 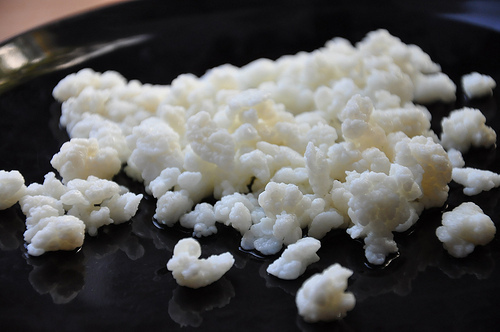 Nonetheless, whatever the type of milk you choose to use, milk kefir grains manage to feed and ferment to any type of milk used. As with water kefir, milk kefir can also be used in several home recipes like dressings and smoothies. It can also be flavoured using vanilla extracts, stevia, honey or maple syrup and is a good alternative for buttermilk, butter or yogurt. 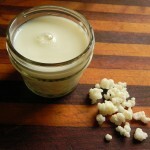 Milk kefir grains can also be used to inoculate cream to make cultured butter or sour cream dressing. 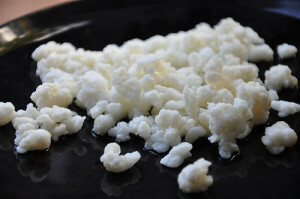 Straining milk kefir yields different varieties of milk kefir cheese ranging from soft, spreadable cheese to cream cheese to hard kefir cheese. Have you ever wonder how to make milk kefir at home? Below is a step by step on how to make your own kefir cultured milk. In a clean glass jar, place the free milk kefir grains. Add milk to three-fourths full and gently stir the contents using a wooden or plastic spoon. Cover jar loosely with a lid to avoid contamination and let it stand at room temperature for about 24 hours or until the mixture thickens or sours to your liking. 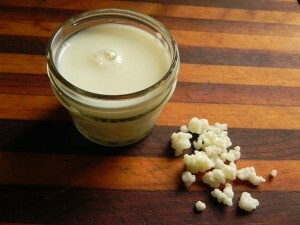 Strain the kefir to separate milk kefir grains from the liquid kefir. Wash the fermenting jar and kefir grains can be recycled for a new batch of milk kefir repeating the whole procedure. Liquid kefir can be taken as is or keep refrigerated and serve chilled. You may also ripen liquid kefir at room temperature for 1-2 days with airtight container then refrigerate and serve chilled. This improves flavour and increases nutritional value as vitamins B and folic acid increase due to bio synthesis of microorganisms present in kefir. Note – This kefir recipe yields 2 cup of milk kefir. I recommend drinking 250ml every day. For starters, you can try it every other day and increase slowly to reach 250 ml per day. Kefir milk allergy is the common side effect, people who are allergic to cow milk must use different kind of milk to ferment such as soy and goat milk. So basically milk kefir doesn’t have any side effect, just be careful in choosing the raw milk to make your ferment kefir drink. Even though Kefir Grains thrive best in animal milk, soy milk or other non dairy milk can also be used as long as revitalization period is done. Revitalization puts Kefir Grains in 1-2 cups of animal milk for 24 hours and once the process is complete, Kefir Grains can be returned to an alternative type of milk (soy, coconut, rice, almond nut and etc!). See below for more varieties of kefir and recipes. Pour soy milk in a clean glass container three-fourths full and add the grains carefully. Cover the container with a lid and leave it in a warm place for 12-24 hours. Every few hours, swish the contents to break up the curds and open the lid to release pressure. After 12-24 hours, strain the milk kefir grains or spoon them out. After removing the milk kefir grains, you may now enjoy your drink. Drain and rinse the almonds after soaking and put them into a high speed blender with 5 1/2 cups of water and blend until smooth, about 1-2 minutes. Line a medium saucepan with double layer of cheesecloth. Pour the nut mixture into the pan and gather up the edges of the cheesecloth then squeeze with all your might to extract every drop of almond milk. Transfer the fresh almond milk into a large container and add the kefir grains then cover. Let it stand at an area with warm temperature and let it ferment for 4-12 hours depending on the temperature. The almond milk kefir will separate while fermenting, don’t worry, just shake it gently or stir it with a non metallic stirrer and continue fermenting until you reaches the consistency and taste you like. Once you reach the taste of your liking, strain the almond kefir with a non metallic strainer. Save the grains for future use. You may now enjoy your drink and refrigerate the remaining almond milk kefir. This could last for about a week. Combine yogurt, half and half and sugar in a pot and heat until near boil. Stir gently to dissolve the sugar. Add egg yolk to the mixture and whisk. Add milk kefir to the egg yolk-yogurt mixture and mix well. Cover and place the mixture in the fridge for 5-10 minutes. After 5-10 minutes. Transfer the yogurt kefir mixture into the ice cream maker. The frozen yogurt should be done in 20 minutes. Topped it with fruits or nuts. In a medium bowl, soak the nuts with ample amount of filtered water. The nuts expand slightly so check the nuts from time to time and add enough water to keep them soaked during the entire soaking period. Cover the bowl with clean cloth and let it soak for 8-24 hours. After 8-24 hours, drain the nuts and transfer them in a high-speed blender. Add 4 cups of water. Blend until smooth, about 2 minutes. Line a medium saucepan with double layer of cheesecloth. Pour the nut mixture into the pan and gather up the edges of the cheesecloth then squeeze with all your might to extract every drop of nut milk. You now have a pan full of creamy nut milk and ball of nut pulp. You may use nut pulp for baked goods, smoothies and other desserts. Place the saucepan full of nut milk over medium heat, around 92°F. Do not heat it above 114°F since kefir probiotics die in such high temperature. Turn off heat and add kefir grains into the nut milk and stir gently. Transfer the nut milk kefir into a large glass container then cover. Place it on a warm area (about 72°F) for 8-24 hours. After 8-24 hours, the milk may separate so shake it gently before using. You may store this up in the refrigerator for up to 14 days. In a jar, combine milk kefir grains with coconut milk. Carefully mix them together with a non metal spoon. Kefir doesn’t like metals. Metals disrupt the process and kefir will not thicken. Secure the jar with mesh cloth and rubber band. Do not screw a lid onto the jar because it might burst due pressure generated from the build up of carbon dioxide from the fermenting grains. Place the jar in a dry area with room temp 70°F and let it sit for 12-24 hours. Give it a few shakes or stirs after 12 hours. You can start tasting the kefir after 12 hours until it reaches the desired level of fermentation. Once the mixture has thickened and has a slightly sour flavor, it has turned into kefir. If your kefir does not thicken within 24 hours, it might be that the temperature in your house is not warm enough. Strain your coconut kefir through a non metal strainer to remove the grains. Store the fermented coconut milk kefir in the fridge until you enjoy it. As for the grains, you can re-use them later by storing them in a glass jar in the fridge. In a clean jar, mix goat milk and kefir grains and stir gently with a wooden spoon. Cover the jar with mesh cloth and secure it with rubber band. Do not screw a lid onto the jar because it might burst due pressure generated from the build up of carbon dioxide from the fermenting grains. Keep the jar away from direct sunlight. Let it sit in a dry, warm area with room temperature around 70°F for 12- 24 hours. Give your kefir a few shakes or stirs after 12 hours. Once the mixture has thickened and has a slightly sour flavor, it has turned into a kefir. Strain your goat milk kefir through a non metal strainer, catching the grains in the strainer. You can recycle the grains later by storing them in a glass jar in the fridge or stir them into a fresh batch of milk and allow to ferment again. The prepared goat milk kefir can be drunk immediately or covered tightly and stored in the refrigerator for up to a week. If your rice milk carton is from the fridge, let it stand at room temperature overnight to keep the milk slightly warm the following morning. This step is essential in helping to activate the kefir grains. 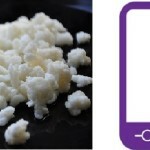 Combine the rice milk and kefir grains into a clean glass container and cover with the lid. Leave the container at room temperature around 70°F for 12- 24 hours. Stir the mixture with a wooden spoon once in a while or you may just shake the container gently. After 24 hours, open the lid and secure the glass container with 2 layers of cheesecloth and rubber band. This will serve as the strainer. Prepare the second glass container. Be sure it is thoroughly cleaned and dry. Pour in the kefir from the first container to the second container leaving the grains in the first container. Have the grains refrigerated for future use. The filtered rice milk kefir can be drunk immediately or stored in the refrigerator for days up to a week. Where to Buy Kefir Milk Grains? I have a good news for people who were interested and wanted to try to make their own milk kefir drink. 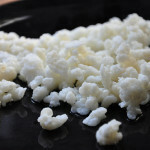 You can buy milk kefir grains here online!